Dog agility is a great sport/hobby/activity that you can do with your dog, whether a pound puppy, registered pure breed, or just about anything in between. 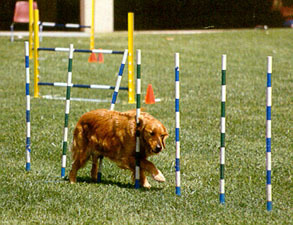 Agility challenges both you and your dog to work as a team to navigate a course of obstacles. It takes training and patience, but your reward is a closer bond with your dog, and new-found friends in the larger community of agility clubs, venues and classes. Click the links below to learn more.